Buying tickets to tour Spain's Alhambra Palace can be a complicated affair. Find out how buying Alhambra tickets works so that you get the most out of your experience. Learn about jumping the lines, understanding the complicated timing system, and spending a night in the Alhambra itself. The extra effort it may take to visit this ancient complex is well worth it. All tips on this page become redundant if you take a guided tour because your expert guide will help you navigate the confusing aspects of visiting one of Spain's most impressive sights. Not only does a guided tour of the Alhambra provide a local expert with in-depth knowledge of the fortress and gardens but you also don't have to go through the trouble of getting tickets on your own. Perhaps best of all is that there's no need to stand in line at every stage of your visit. If you don't want to book a guided tour of the Alhambra, then be sure to book your tickets 90 days in advance. Tickets sell out fast, and you don't want to be disappointed. Your best bet for securing advance tickets is to buy online through the official Alhambra website. Note that other websites are mostly commercial companies trying to sell you tours, therefore, they may hide the fact that you can also buy regular tickets. At the Alhambra Shop - The bookshop can be found at Calle Reyes Católicos 40 in Granada city center. At the Alhambra itself - The ticket office at the Alhambra is only open for on-the-day tickets. At the height of summer (mid-August), you have to line up from about 6 a.m. to be guaranteed a ticket. Does the website say its Alhambra tickets are sold out? Don't give up. You can still try to get tickets in person or take a guided tour. Nasrid Palace: When you buy your Alhambra ticket, you are given the choice of when to enter the Nasrid Palace. This is the most popular part of the Alhambra, so to prevent overcrowding, the authorities have restricted entry to 300 visitors every 30 minutes. The Alhambra in general: The Alhambra has two sessions—the morning session and the afternoon session. Your palace entry time tells which session you must enter. When you approach the building complex, you will see a guard. This may look like the entrance, but it's not; keep walking until you see the line—there will always be one. Other buildings: The Alcazaba (fortress) and some of the other buildings in the Alhambra are restricted to a single entry, though what time you enter is not restricted. If you try to enter too close to your palace entry time, the attendant will kindly suggest that you visit the palace first then come back later. The times for you to enter the Alhambra grounds and the Nasrid Palace are strictly enforced. But no one tells you when you have to leave. Once you are inside, you can stay as long as you like. If you enter in the morning session, you can stay until the afternoon if you want. Nasrid Palace - The Palaces of Mexuar, The Comares, and Mohammed V. The marvelous Moorish architecture is the highlight of the Alhambra. 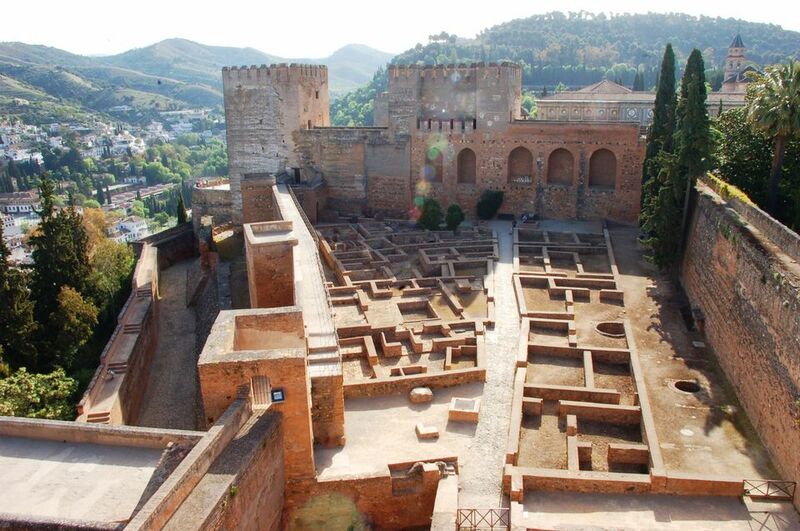 Alcazaba - See the military fortifications of the Alhambra. Palace of Charles V - This was an attempt to marry Christian design with the existing Arabic styling. It began in the 16th century but wasn't finished until the 20th. Rauda - Visit this cemetery for Royals. Medina - This mini-town has public baths and housing for government officials. Museo de Bellas Artes - Granada's fine art museum is found on the grounds of the Alhambra. Generalife Gardens - These gardens are an attraction in their own right (you can visit them separately if you want). The orchards and gardens surrounding the villas were used by the Moorish rulers in their leisure time. Though Granada is one of the top favorite cities in Spain, most of its sights can be seen on a day trip. The walk up to the Alhambra is very pretty, but it's also very steep. If you'd prefer to take the bus up, catch it from the stop in Plaza Nueva. There are less frequent buses to and from the Albayzin Moorish quarter. The Alhambra is also a hotel. Spain's state-run Parador network features some of the best hotel settings in Spain, and arguably the best is the Alhambra. Foreign tourists visit the Alhambra year-round, but the biggest obstacle to getting tickets will be the large numbers of Spanish tourists who travel at particular times of the year. The Spanish tend to travel on weekends, especially in summer. Public holidays are also a popular time to travel. Note that when a public holiday falls on a Tuesday or Thursday, the Spanish do what they call a puente (bridge), taking the Monday or Friday off, too, to make for an extended weekend. These days will also be popular times to visit the Alhambra.